To make the Adobo Sauce: Cover the chiles with boiling hot water and let them soak for 10 minutes. Pace the chiles along with 1/2 cup of soaking liquid, onion, garlic, oregano, vinegar, sugar and salt in the blender. Purée until smooth. In a saucepan set over medium heat, heat the oil. Once hot, pour the sauce into the oil; cover the saucepan, leaving it slightly open, and let the sauce season and thicken for 6 to 8 minutes, stirring here and there. Remove from the heat. To make the Fish: Baste the fish fillets with the adobo sauce; you may refrigerate them and let them marinate for up to 24 hours. In a large skillet coated with oil and set over medium-high heat, cook the fish for about 3 to 4 minutes per side. To make the Salsa: Heat a grill pan, a grill or a nonstick skillet over medium heat until hot and lightly coat with safflower or corn oil. Cook the pineapple slices for about 4 minutes per side until they are slightly charred. Remove from the heat, once cool enough to handle cut into bite-size chunks. Place in a mixing bowl and toss with the cilantro, chile, lime juice, oil and salt to taste. 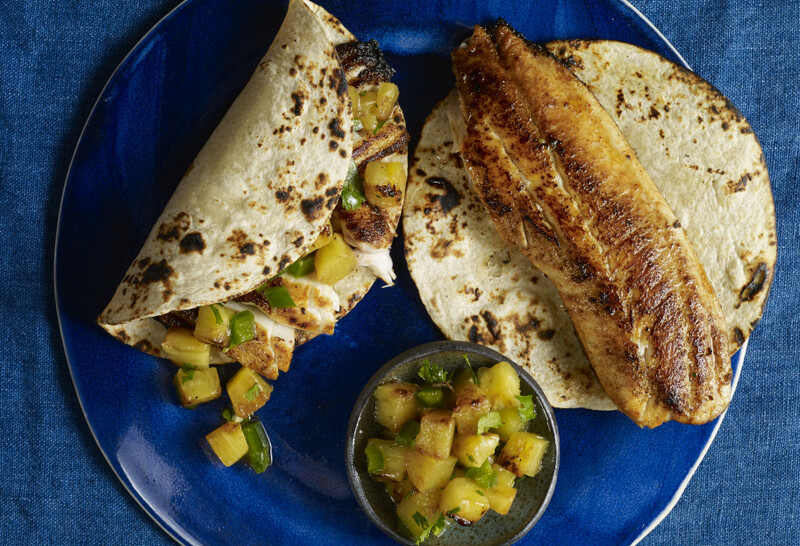 To assemble Tacos: Place the warm tortillas, the pineapple salsa and the fish on the table, then assemble the tacos! Se ve muy buena la receta. Ideal para preparar en esta temporada de cuaresma. Como esta? Hoy mi cuñada y yo hicimos esta rica receta. No teniamos vinagre de manzana asi que usamos vinagre de piña, aun asi salio riqusima. Muchas gracias por compartir sus recetas con tanta gente. When it says to baste the fish or marinate for up to 24 hours, if I choose the baste method, does that just mean baste and immediately start cooking? Or does it need some marinating time? If you baste it, you can cook it right away, but you can also let it marinade and soak up more flavor for up to 24 hours. Enjoy the tacos, Brendan! Omg, so good Pati. I have watched you since you aired with Paula Deen. You gave her a cover for her blender. I’ve watched you ever since. You inspire me very much. Thank you for being real with your heritage. Aw thank you so much Dominique for watching me from the beginning and for your kind words. Keep having lots of fun kitchen adventures! Oh wow…thank you so much Serene! I made this. It’s really easy and it’s SOOO good! Thank you Pati for this wonderful recipe! So happy to hear this Carolena! at the end it should read PLACE the chiles . . . the L is missing….